I use Mint.com to keep track of my budget. Really easy and automatically syncs with your bank accounts. Not that complicated of a concept but americans can’t seem to figure it out. I would recommend not even having a credit card. Trust me your car will break down some time and you will have to fix it. It is good to have money saved up so that you don’t go into debt which you have to pay back with interest. You would rather have the interest working for toward your retirement. What to pay off next? If you have debt you probably ask yourself what should I pay off next. This is a question that I had been asking myself lately as we are getting close to paying off one of our student loans. Luckily one of my friends knew about a great site to help you figure out what to pay off next. The site is unbury.me. The site is pretty simple. You type in a name for each loan or credit card, current balance, min payment, and Interest. Then click calculate. I like the ability to switch between the two methods to see how soon I can have the debt paid off. One thing that makes it easier to get rid of things is to have a place to put them until you are able to actually bring them to be donated. We always have at least 1 bin in our house that we call our Goodwill bin. Usually it is by the front door or possibly in our guest bedroom if we are expecting company. If you find something you feel that you no longer need it can be a pain to bring this to Goodwill or Love Inc or whatever is near you right when you decide to get rid of the item. But, if you have place for these items in your house it does not take much effort to put something in a bin. Then when the bin or bins get full you can take the time and energy to bring them to be donated. Todays post is all about why are you buying what you are buying. Next time you are about to buy something try to think of these things and see if you still want to buy it. If the answer is yes then go ahead. If it is no maybe you should put the purchase back and think about it a little more. If it replaces something is the thing you are replacing need to be replaced because A) it got old and just needed to get thrown away even if you didn’t use it that much? B) You just want something new? or C) It is something that you have used so much that it got worn out and you really need a new one. If it is C then you are more likely buying it for a good reason. Does it provide me with more time? Does it allow me more time to do other things? I have someone mow my lawn. Granted I got a really good deal but I do it because I hate mowing the lawn and it frees up that time every week for me to do other things. Will this thing make me happy? Sounds like a simple question but you have to go a little deeper. Am I buying it because the item will make me happier or because the act of buying something new makes me happy? If it is the act of buying something then I recommend a pack of gum or something else sub $1. Without looking at the price how much would you pay for it? After you decide how much you would pay for it then look at the price tag. If it is higher than what you perceived the value to be then I would recommend not getting it. This I find particularly helpful with art. My wife and I like art but we take a while before we purchase something. I often ask myself is “how much would I buy that for?” 9 times out of 10 it is a lot less than what they are asking. Everything has to have a place. Figure out where that place is before you even purchase the item. This is one thing that has been a blessing for us in our small house. My wife likes looking at furniture and I always say where are we going to put it. This has saved us so much money. No one wants to keep something forever … well a gold bar would be cool but impractical. At some point we may want to get rid of this item. Will this item keep its value or possibly go up? This goes hand in hand with is it of good quality? If not I would recommend not getting it until you can afford something that won’t break in a month and force you to buy it again. How many people in the household would use it or enjoy it? If you live with a wife and kids, roommates etc. How many people will want to use it? If you are the only one should you really get it? If everyone gains joy from it then it may be a good purchase. Next time you are going to buy something ask yourself these questions first. Joshua over at becoming minimalist has an article about how you can’t just clean and organize, you also have to get rid of things. He goes into detail on all of these and I recommend clicking on the link and reading them. He goes on to talk about how getting rid of things actually accomplishes all of the items on the list. Since last week I did a post about my closet purge I thought it would be a good idea to do one on how my closet is organized now. As you can see I have things pretty well defined. This post is more about automating your life and making things really simple more than smaller. 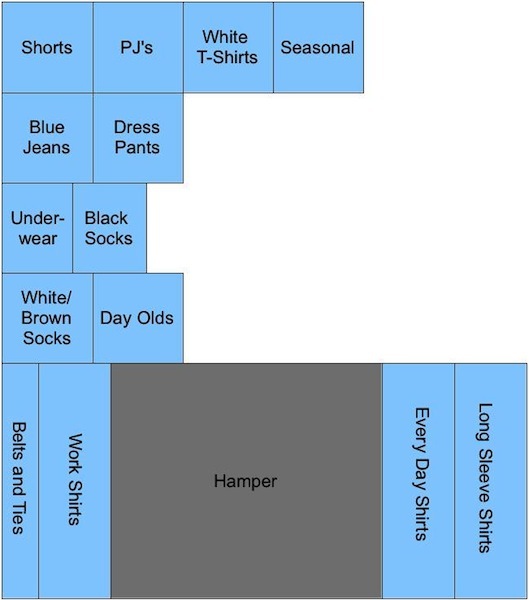 I know I could easily fit my clothes into less space but then it would not be as simple. I am going to try to point out things that are not self explanatory. Socks – When I need new socks because the old ones get to many holes in them, I throw out all of that color sock that I have left. Then I buy 2-3 packs of the new socks that are the same color. Then I put them in their home place. I don’t roll them, fold them in pairs, etc. I just group them by color and in the morning when the room is dark I can always grab a pair that matches without having to think about it. As time goes along they all get used and if I have to throw out one here and there no big deal because they are all the same. I keep white and brown socks together because the color difference is still big enough that I can grab them in low light and I didn’t want any more bins. 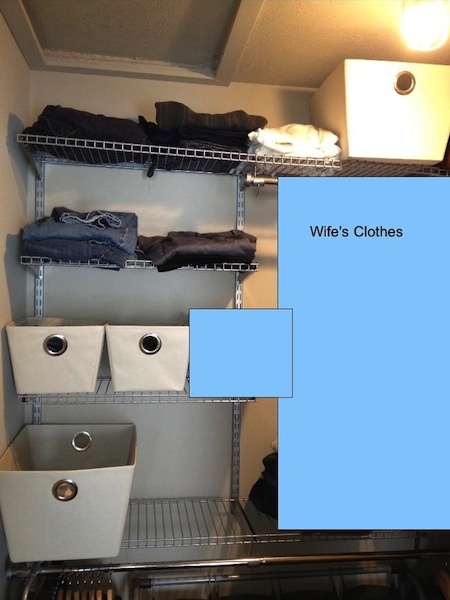 This is different from my wife who has a bunch of socks that have to be matched exactly to 1 other sock in the bin. Way more work than what I want to put in when I am still half asleep. Day Olds – If I have worn something for part of the day and it is not dirty yet. I fold it up and put it here. I don’t like mixing in my old clothes in with my clean clothes. Work Shirts – These are all of the shirts I have with my companies logo on them. In the morning I just pick one at random and put it on and I know I am ready to work. Every Day Shirts – 90% of these could also be worn to work but since it isn’t 100% I keep them separate. Hamper – I love this hamper. Each of the bags is exactly the size of one load of laundry. So when it fills up I pull it out and run that load. When I first started downsizing my clothes the hamper would not even fit underneath where it is now. Shows you how much I have purged down. Minimalism is not a lack of something, it’s simply the perfect amount of something.